Discussion in 'Patch Notes' started by Senshu, Mar 29, 2016. 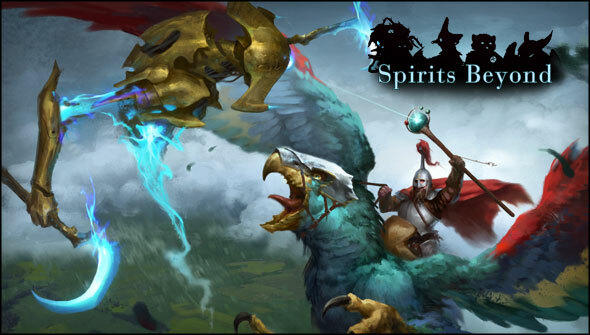 Spirits Beyond is here, and with it comes new runes, a campaign, balance changes, and more! Now you can see everything that was brought up in the Preview Video as you play. 51 New runes have been added to Pox Nora. Three of these new runes are Limited Edition. The League Rewards have been updated to award Spirits Beyond runes. The all new challenging Hand of Death campaign has been added to Pox Nora, and is available for purchase on the Marketplace. Completing this brand new campaign on Legendary difficulty will award the Glimpse of Death limited edition rune! Spirits Beyond Pack has been added to the Marketplace. This pack comes with: 6 common, 3 uncommon, and 1 rare rune. Each rare slot has a 10% chance of becoming an exotic. Each pack comes with 1 FREE Platinum Token.. Spirits Beyond has been added to the Marketplace. This box comes with 10 Spirits Beyond packs. Get 9 packs and the 10th is FREE. The first pack is guaranteed to contain an Exotic and 500 FREE Shards. Spirits Beyond Megabox has been added to the Marketplace for a limited time. This mega box comes with three Spirits Beyond boxes, one of 2 LEs (Valdaci Emerald or Valdaci Shield) and an additional 5 FREE Platinum tokens. The rewards for Heroic Achievements no longer count against the daily gold limit. Made some more improvements on the back end to the Heroic Achievement system. The Rune Forge limit on crafting Exotic and Legendary runes has been increased to 20 per week from 6 per week. An all new Spirits Beyond Story chapter is now available! The Visions of Amareth expansion has been added to the Rune Forge. Due to player feedback we have given the Mountain Slag champion new art. The old art has been repurposed into a new Armored Fesh for Spirits Beyond. Website is now fully using the new League icons. Website rankings will now include all non-Standard Leagues. Range champions have been adjusted to be more balanced in relation to melee. As part of this expansion some maps have had their Font and Shrine locations altered or new versions of existing maps have been added with new placements. All the maps listed comprise the new ranked map rotation. Faction Bonus for having a full faction K'thir Forest has now been changed to +1 Speed not +1 Speed and +1 AP. The Visions of Amareth Final Days Event has concluded. Packs have been awarded to players based on fulfilling the reward criteria of 1 Visions of Amareth pack for every 10 Ranked matches played lasting 10 minutes or longer. Congratulations to the grand prize winner, Braxzee, who won one of every Visions of Amareth rune. Braxzee was randomly drawn out of all the players who met the maximum reward criteria of earning 5 packs. To redeem the packs once they have been rewarded, you will need to go to the Marketplace and click on the link that says Entitlements at the top of the screen. All players who played a minimum of 50 ranked matches and their primary faction was the Drums of War Winning Faction, Forsaken Wastes, have been awarded 2000 Gold along with 5 Three Day Gold Bonus Tokens. Drums of War and Player Ranks have been reset. The Players who were the highest contributors to their faction and highest ranked player from each faction have been awarded 15000 Gold. Fixed several issues that would result in error messages in a match. Fixed an issue that was resulting in enemy champions being deployed at the Player's Shrine on the Wrath Walkthrough Campaigns. Fixed an issue where the condition from the spell Escape Magic couldn't be dispelled. Fixed an issue that was causing the spell Mirrorhold to instantly destroy champions with the Titan ability. Fixed an issue where the ability Divine Regeneration was cleansing the Sundered Lands Avatar. Fixed an issue where the equipment Soul Reaver continually defile in AE3 while it was equipped. Fixed an issue with the ability Blindfire where the minimum range of the ability wasn't reflecting the min range of the champion. Fixed an issue where the ability Planar Bound would not prevent relocation from the spells Undertow and Swap. Fixed an issue where the ability Teleport: Blood Ball would use AP and go on cooldown when targeting a Blood Ball that is on inaccessible terrain. Fixed an issue where the condition Incorporeal was calculating Damage before Defense not after, which resulted in higher than intended damage reduction. Fixed an issue with the spell Pride of Sarnghaver where it would not last the full duration and could not be dispelled when it should. Fixed an issue where the ability Soulsift would not trigger if the champion is killed by the ability Short Lived. Fixed an issue where the ability Feint was using the champion's MIN RNG instead of Range 1-5. Fixed an issue where the ability Heart Strike would affect relics. Fixed an issue where the spell Lay Bridge was not converting affected Chasm spaces into Stone. Fixed an issue where the ability Bile Explosion would not give condition Scoured. The condition from the spell Repurpose can now properly be dispelled. Fixed an issue with the spell Arise that would prevent Stitched champions from being deployed if the Stitched Remains were on certain terrain types. Fixed an issue where the ability Charged Blast was not targeting 2x2 champions under certain conditions. Fixed an issue where the ability Warding would persist if the ability Warchief: Stone Clan was removed form the champion in-match. The ability Mindflayer Jumper will now properly equip the closest friendly unequipped champion with Mindflayer. Fixed an issue where the ability Ice Block was missing an icon. Fixed an issue where the spell Ferocity of Kain Taris could not be cleansed. Fixed two issues with the ability Locust Swarm where the debuff would incorrectly affect friendly units and would not affect Stealthed units. Removed the preview range for the ability Dimension Door on the Dimension Door relic. Fixed an issue where the ability Burning Sandspout was not giving the Charred and Inhibited conditions if the target had the condition Sandblasted and was not on sand. Fixed an issue where the ability Quest: Complete Training was only increasing the max HP instead of current and max. The condition from the spell Escape Magic can now be dispelled. Fixed an issue where the ability Ooze Tap was affecting champions with alternate forms of flight like Arctic Flight. Fixed an issue with the spell Mimic that was causing it to not appropriately copy the adjacent enemy champion's upgrade abilities. Fixed an issue where the relic Artillery Marker would not trigger if the movement was not "normal movement" such as movement from Wandering or Manic. Fixed an issue with the spell Blink not returning champion if terrain effect was activated on that champions redeployment space. Xzablaz, Tarathil, newsbuff and 2 others like this. Description: When an opposing real champion within 5 spaces is destroyed, a Young Sapling without upgrades is summoned adjacent to this unit. Description: This champion gains the upgraded abilities of the last enemy champion deployed from the runedock while this champion was in play. This effect lasts until this ability is activated again. Description: You gain 4 nora when an enemy relic is destroyed. If the relic was Summoned, you gain 2 nora instead. Description: Enemy champions within 5 spaces lose between 5 and 15 HP and this champion gains MAX HP equal to 75% of the amount lost. If this champion has more than 75 HP, it is destroyed. Description: When an opposing real champion within 5 spaces is destroyed, a Grave Warrior without upgrades is summoned adjacent to this unit. Description: Target summoned champion within 5 spaces is destroyed. The closest friendly champion within 5 spaces and this champion heals for 8 HP. Description: When this champion is deployed, a Grundelwulf Pup with no upgrades is summoned adjacent to it. Description: When this champion is successfully attacked by a basic attack, the attacking champion loses 3 AP. Description: Friendly Elves within 5 spaces have Overkill: Healing and Cull. Description: When this champion is within 5 spaces of a friendly champion with Arrow Eater or Elusive, this unit gains Regeneration 2 and +1 SPD. Description: Friendly champions with Class: Witch within 5 spaces of this unit gain Forsaken Exploit. Description: Target summoned champion within 5 spaces is destroyed. Friendly champions get +2 DMG for 2 turns. Description: When this relic is destroyed, it deals 15 damage to opposing champions within 5 spaces.This explosion deals -2 damage for every space away from the center of the blast. This relic destroys itself at the end of the turn after coming into play. Description: Summon a Long Fuse Bomb relic with Long Fuse Bomb, Impregnable and Pariah to target space within 4 spaces. Description: If this champion kills another champion, it permanently gains +10 MAX HP, +2 DMG and gains Freezing Discipline, then this ability is removed. Description: At the beginning of each turn and whenever this champion moves, the spaces this unit occupies becomes a Firewall (Whenever an opposing champion enters this space, it takes 12 Fire damage and becomes Charred 2) for 3 turns. Description: When this champion is destroyed, if it is equipped with a Mindflayer, the closest friendly unequipped champion is equipped with a Mindflayer. This will only jump from the original champion one time. Description: When a friendly champion is deployed from the rune dock, this champion's cooldowns are reduced by 1. Description: At the end of its turn, if this champion did not move that turn, it becomes Stealthed for 5 turns. Description: This champion comes into play with 2 Stitchling Riders. At the beginning of your turn, this unit heals 3 HP as long as it has at least 1 Stitched Rider on it. When this champion is successfully attacked by a basic attack, it loses a stack of Stitchling Riders and a Symbiotic Stitchling with no upgrades is summoned adjacent to the attacking champion. Description: Friendly champions with Race: Jellebrium within 5 spaces have Spell Resistance and Psychic Magnetism. Description: At the end of your opponent's turn, if this champion was not successfully attacked that turn, it gains 1 AP. Description: When this champion makes a successful basic attack against a champion with 50% or less HP, it gains 1 AP and has +2 DMG for the attack. Description: Until target friendly champion within 3 spaces moves, it has Overseer: Moga 2, Improve Speed. Friendly champions within 5 spaces of it have Evasive 2. This affects a maximum of 1 target at a time. Description: When this champion is deployed, a Bloody Imp with no upgrades is summoned adjacent to it. Description: For 2 turns, this champion loses Tough, gains Impairing Feedback, Mobility, Poison Cloud 2 and its RNG becomes 3-5. Description: When this champion is within 5 spaces of a friendly champion with Class: Tinkerer, it gains +1 SPD and Regeneration 2. Description: When an opposing real champion within 5 spaces is destroyed, a Level 1 Revenant is deployed adjacent to this unit. This unit loses 5 HP when this effect triggers. Description: When this champion is not occupying lava, its RNG becomes 1-1 and gains Resistance: Physical 3, +2 DEF. Description: When this champion is deployed, a Wolf with no upgrades is summoned adjacent to it. Description: Whenever a champion takes Acid damage, this champion heals 2 HP. This triggers up to 3 times per turn and does not include damage from Scoured. Description: When a non-flying opposing champion within 5 spaces enters Ooze, it takes 2 Acid damage and friendly Slags occupying Ooze within 5 spaces of this unit each heal 2 HP. This does not stack. Description: Gain a random ability that is not a basic attack from target opposing champion within 5 spaces. Friendly Goblins within 5 spaces of this champion also gain that ability. This ability does not break stealth and is removed upon use. Description: This unit gains Amphibious. For each friendly Snaptooth within 5 spaces, this champion gains a rank of Multiattack. Description: Friendly champions with Race: Snaptooth within 5 spaces of this unit gain Weary and Essence Capture. Description: Target opposing champion within 4 spaces loses 1 AP. Friendly Imps within 5 spaces of the target each gain AP equal to the amount lost. Description: When a champion you own with the same race as this one is attacked, this champion becomes Enraged 1 for 2 turns. Description: When this champion is deployed, a Garu Cub with no upgrades is summoned adjacent to it. Description: Friendly champions within 5 spaces have an additional rank of Regeneration. Description: Opposing Cursed champions take 5 magical damage. This damage ignores DEF. Description: When this unit takes 5 or more damage, an Ice Block relic with 2 HP is summoned 5 spaces away from this champion (if there are no empty spaces, it will be summoned farther away). Description: Target champion within 5 spaces has -4 SPD for 3 turns. Description: This unit is relocated to the closest non-damaging space to target champion within 5 spaces and that champion takes Physical damage equal to this champion's DMG plus 2. Description: When this unit is successfully attacked by a basic attack, the attacking champion gains Wandering for 3 turns. Description: This unit gains Evasive 3 for 2 turns and all opposing units within 3 spaces takes Physical damage equal to this unit's DMG. Units successfully damaged becomes Eviscerated for 3 turns. Description: At the beginning of your turns you lose 2 nora. Description: This champion recovers 4 AP. This ability is removed after use. Description: Target champion within 3 spaces gains Drink Action Potion for 6 turns. Description: This ability begins play on cooldown. This champion is Cleansed, loses this ability and the ability Become: Bull, and then it gains Heal Champion 2, Council: Spells, Attack: MagicalClass: Shaman, its range becomes RNG 2-4. Description: This ability begins play on cooldown. This champion loses this ability and the ability Become: Shaman, is Cleansed, and gets +3 DMG, +10 HP, +1 DEF, class Shaman, Unstoppable and Pummel 1. Description: When an opposing real champion within 5 spaces is destroyed, a Young Bat with no upgrades is summoned adjacent to this unit. Description: Whenever a champion takes Electricity damage, this champion heals 2 HP. This triggers up to 3 times per turn and does not include damage from Shocked. Description: Whenever a champion takes Fire damage, this champion heals 2 HP. This triggers up to 3 times per turn and does not include damage from Charred. Description: When this champion is deployed, a Pygmy Hippo with no upgrades is summoned adjacent to it. Description: This champion becomes Stealthed for 6 turns. At the end of this turn, it gains Regeneration 3, Immobile, Pacified and cannot activate abilities for the next 4 turns. If it becomes destealthed these effects are removed. Description: At the end of your turn, the closest opposing champion within 3 spaces takes 8 Physical damage and is moved adjacent to this relic. Description: Target friendly Arthropod within 5 spaces is relocated to a space adjacent to this unit. Description: Target summoned champion within 5 spaces is destroyed. The closest enemy champion within 5 spaces takes 10 acid damage. Description: Whenever a champion takes Magic damage, this champion heals 2 HP. This triggers up to 3 times per turn. Description: Whenever a champion takes Frost damage, this champion heals 2 HP. This triggers up to 3 times per turn and does not include damage from Chilled. Description: When this champion is successfully attacked by a basic attack from RNG 4 or greater, the attacking champion becomes Paralyzed for 3 turns. Description: Sacrifice target owned adjacent champion and this champion is healed for the amount equal to the destroyed champion's current HP. Description: While Stealthed, if an opposing champion moves adjacent to this champion, this champion makes a free attack against that opponent that ignores DEF if it is greater than 0 and causes Ensnared 2. Sealer0, Tarathil and Lushiris like this. Description: When this unit is destroyed, it deals 14 Fire damage to each champion and Relic within 2 spaces, and deals half that much damage to any Shrine within 2 spaces. Affected spaces become Lava for 4 turns. This damage ignores DEF. Description: When this unit is destroyed, it deals 11 Fire damage to each champion and Relic within 2 spaces, and deals half that much damage to any Shrine within 2 spaces. Affected spaces become Lava for 4 turns. This damage ignores DEF. Description: When this unit is destroyed, it deals 8 Fire damage to each champion and Relic within 2 spaces, and deals half that much damage to any Shrine within 2 spaces. Affected spaces become Lava for 4 turns. This damage ignores DEF. Description: When this unit is destroyed, it deals 5 Fire damage to each champion and Relic within 2 spaces, and deals half that much damage to any Shrine within 2 spaces. Affected spaces become Lava for 4 turns. This damage ignores DEF. Description: Target friendly relic within 5 spaces is relocated to the nearest available space adjacent to this unit. This ability cannot target Planar Bound or Immobile units. Description: After 10 turns, this ability is removed and this unit is Cleansed and gains +20 MAX HP, +1 RNG and +1 SPD permanently. Description: When this champion successfully damages a champion with a basic attack, that unit becomes Inhibited for 6 turns. Description: This champion takes 5 HP of physical damage and makes a ranged-combat, Physical attack at DMG 10 and RNG 5. This damage ignores DEF. Description: When this unit takes 5 or more damage, a Carrionling with no upgrades is summoned 5 spaces away from this champion (if there are no empty spaces, it will be summoned farther away). Description: Champions within 5 spaces of this champion are Grounded. Description: Area Effect 3, Range 5: Affected opposing champions have -3 DEF for 3 turns. Description: This champion makes a Physical attack for 10 damage against target enemy unit at RNG 1-5. This damage ignores DEF. If the target is successfully damaged, it loses all AP. Description: This unit makes a Magical attack at RNG 2-5 at 12 DMG and the closest friendly champion to the damaged champion takes 4 magic damage as well. This damage ignores DEF. Description: This unit makes a Magical attack at RNG 2-5 at 10 DMG and the closest friendly champion to the damaged champion takes 4 magic damage as well. This damage ignores DEF. Description: This unit makes a Magical attack at RNG 2-5 at 8 DMG and the closest friendly champion to the damaged champion takes 4 magic damage as well. This damage ignores DEF. Description: Target friendly champion within 3 spaces becomes Nora Shielded for 4 turns. Description: Target friendly champion within 3 spaces becomes Nora Shielded for 2 turns. Description: When damage would be dealt to your Shrine, it is dealt to this unit instead, and the damage is reduced by 2. Redirected damage cannot be reduced. Description: When damage would be dealt to your Shrine, it is dealt to this unit instead. Redirected damage cannot be reduced. Description: When this unit takes 5 or more damage, a Spiderling with no upgrades is summoned 5 spaces away from this champion (if there are no empty spaces, it will be summoned farther away). Description: At the start of your turns, enemy champions within 4 spaces take 1 Physical damage and are knocked back 1 space (does not affect Stealthed champions). Description: Target friendly champion within 5 spaces is relocated to the nearest available space adjacent to this unit. This ability cannot target Planar Bound or Immobile units. Description: This champion makes a Fire attack at RNG 2-5. If the target is successfully damaged, it also becomes Charred for 4 turns. Description: This unit makes an attack at 50% DMG and RNG 2-5. If successful, that unit becomes Slowed for 2 turns. Description: When this champion makes a successful basic attack against a champion, the target becomes Sundered for 3 turns. Description: When this champion makes a successful basic attack against a champion, the target gains 2 stacks of Sundered for 3 turns. Description: When this unit takes Psychic damage, that damage is increased by 25% (after DEF). Description: When this unit takes Disease damage, that damage is increased by 25% (after DEF). Description: When this unit takes Acid damage, that damage is increased by 25% (after DEF). Description: When this unit takes Sonic damage, that damage is increased by 25% (after DEF). Description: When this unit takes Poison damage, that damage is increased by 25% (after DEF). Description: When this unit takes Electricity damage, that damage is increased by 25% (after DEF). Description: When this unit takes Frost damage, that damage is increased by 25% (after DEF). Description: When this unit takes Fire damage, that damage is increased by 25% (after DEF). Description: When this unit takes Magical damage, that damage is increased by 25% (after DEF). Description: When this unit takes Physical damage, that damage is increased by 25% (after DEF). Description: When this unit takes Acid damage, that damage is reduced by 20% (after DEF, rounded down). Description: This champion gets +1 SPD, +3 DMG, and Careless. Description: Destroy target small champion occupying Water. Units with Flying or Amphibious cannot be Drowned. Description: Equipped champion has Regeneration 3 and Attack - Magical. If the champion is a Salaman, the closest enemy champion within 5 spaces becomes Blinded for 2 turns. Description: Target champion without a Buffer gains a Buffer of 5 HP per friendly champion with Race: Spirit (to a maximum of 30 HP). Description: Damaged enemy champions become Diseased and Inhibited for 4 turns. Description: All friendly Undead champions gain Assimilate for 1 turn. Description: Equipped champion is Cleansed and gains Purified. On deploy, enemy champions within 5 spaces are Cursed, Defiled and Branded for 5 turns. Description: All relics and equipment are returned to its owner's runedock with 0 CD and the owner recovers Nora equal to 50% of the relic or equipment's Nora Cost. Description: Target champion gains Courage (This unit has +2 DMG (up to 6) and +1 DEF (up to 3) for every 8 HP it is missing). Description: Equipped champion gains +1 DEF, Tough 1 and is Intoxicated. If this equipment is destroyed while equipped to a Dwarf, it becomes Enraged 1 for 2 turns. Description: Equipped champion gains Attack - Fire, Burn 1, and Prestige. If equipped on a Paladin, it also gains Inhibiting Touch. This equipment can be dropped as a relic that causes all spaces within 3 spaces to become Hallowed Ground. Description: Equipped champion is Cleansed and is Intoxicated and gains Regeneration 2 . If this equipment is destroyed while equipped to a Dwarf, it becomes Enraged 1 for 2 turns. Description: Target champion gets +10 MAX HP (this does not stack). For the next 4 turns, spaces currently within 3 spaces of the targeted champion are Vegetation. Description: Area Effect 3: For 4 turns, friendly champions gain Combat Awareness 1 and Spell Resistance. Description: Equipped champion has Overseer Moga 2 and gains Race: G'hern. If the equipped champion is a Warrior, Brute, or Moga it also gains Pawn. If the equipped champion has G'hernbound the ability will be removed while equipped. Description: Equipped champion gains Reckless Flight and Gain Control. Tarathil and SaintKiwi like this. Description: Champion is cleansed and gains Purified and takes 2 Fire damage at the start of your turn. This equipment can be dropped as a relic that dispells and causes 4 Fire damage to enemy Units within 3 spaces at the end of your turns. Description: Equipped Champion gains Domain: Sand and Evasive 2. Description: Equipped melee champion gains Zeal, Heart Strike and +1 DEF and you gain 3 nora for each basic attack it makes. Description: The closest friendly champion to target friendly champion within 8 spaces becomes Stealthed for 4 turns and is relocated to an adjacent space. The relocated champion loses all but 2 AP. Description: Target a real champion you own. For 3 turns, damage to friendly champions is prevented and the target champion loses HP equal to the damage prevented. Description: Equipped champion has Damage Shield - Fire 3, Inhibiting Touch, Trail: Lava and Immunity - Fire.